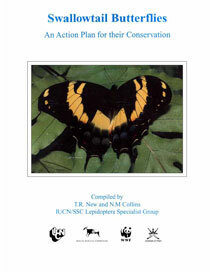 This is the first insect Action Plan prepared by the IUCN Species Survival Commission, and was chosen because swallowtail butterflies are perhaps the most charismatic to non-entomologists. Some are the largest butterflies which exist, and the “birdwings” in particular have long excited wonder and comment among naturalists of all persuasions. Out of a total of 573 species, 170 are considered to need conservation action. This Action Plan exemplifies the wide-ranging conservation needs of swallowtails by selecting a geographically broad suite of faunas and individual taxa for priority conservation action. Endangering processes are accelerating alarmingly in most of the regions listed for attention. The plan covers 34 regions throughout the world, considering within each region the conservation status of particular species, action needed, and how projects could be undertaken, together with an indication of costs involved.